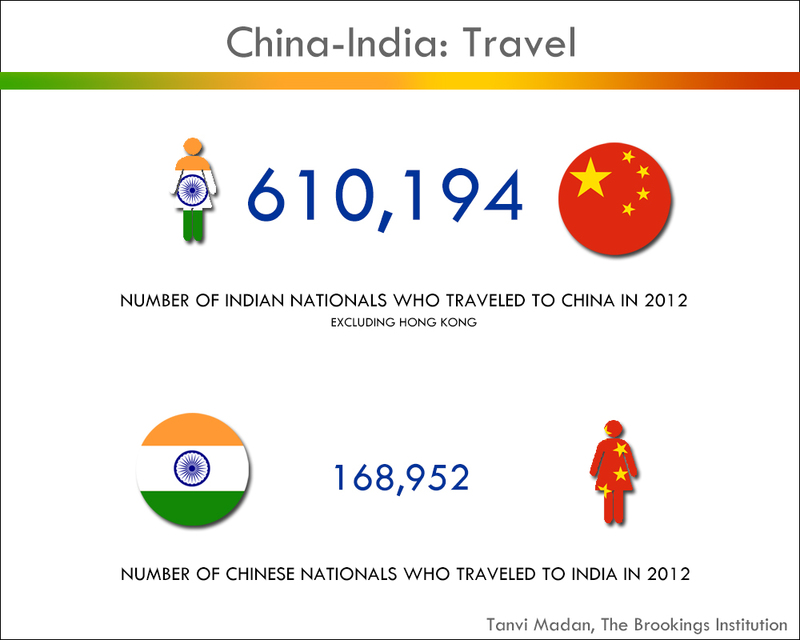 Later this week, when Chinese President Xi Jinping and Indian Prime Minister Narendra Modi meet in China, they’ll be representing more than one third of humanity. The countries they lead have two of the largest economies and militaries in the world, are among the fastest growing global energy consumers, and have economies that are expected to grow at about 7 percent this year. There’s a reason the two are called Asian giants—and whether or not they get along, and how they do, has implications beyond their region. Neither China nor India nor India’s relationship with China are what they used to be a decade and a half ago. For one, there is much more high-level engagement, with senior policymakers meeting in bilateral, regional, and multilateral gatherings. The two countries have a number of political dialogues in place, including on Afghanistan and counterterrorism, as well as a defense dialogue and a number of economic dialogues. The countries’ border dispute remains unresolved, but mechanisms have been put in place to manage it. They have cooperated in multilateral settings, including on climate change, trade, and global economic governance. When he had been ambassador to China, current Indian Foreign Secretary S. Jaishankar had called economic cooperation the “the game changer” in the relationship. Indeed, bilateral trade has gone from just over $2 billion in 2000 to 2001 to $65 billion in 2013 to 2014 and the investment relationship has also grown as well, albeit more slowly. There’s also more people-to-people interaction, with close to 800,000 people traveling between the two countries in 2012—four times the number a decade before. However, the old sources of strain have not disappeared and some new ones have emerged. While the lack of resolution of the border dispute might not have stopped Sino-Indian engagement, it might have slowed its pace and set a ceiling on it. Beyond the border, the issue of Tibet (particularly the presence of the Dalai Lama in India), the sharing of river waters, China’s increasing activities in India’s immediate neighborhood (especially its close relationship with Pakistan), as well as Chinese wariness about India’s relationships in its periphery, have been sources of concern. Economic and people-to-people ties have been asymmetrical. There is now also more daylight between where China and India stand on the issues of regional trade and climate change. Connectivity has remained limited—for example, there’s only one almost-daily direct flight between Delhi and Beijing, and no direct flights connecting Mumbai and Shanghai, the two financial capitals. There is also an overall sense in India that China does not respect India and/or that it will seek to prevent India’s rise. 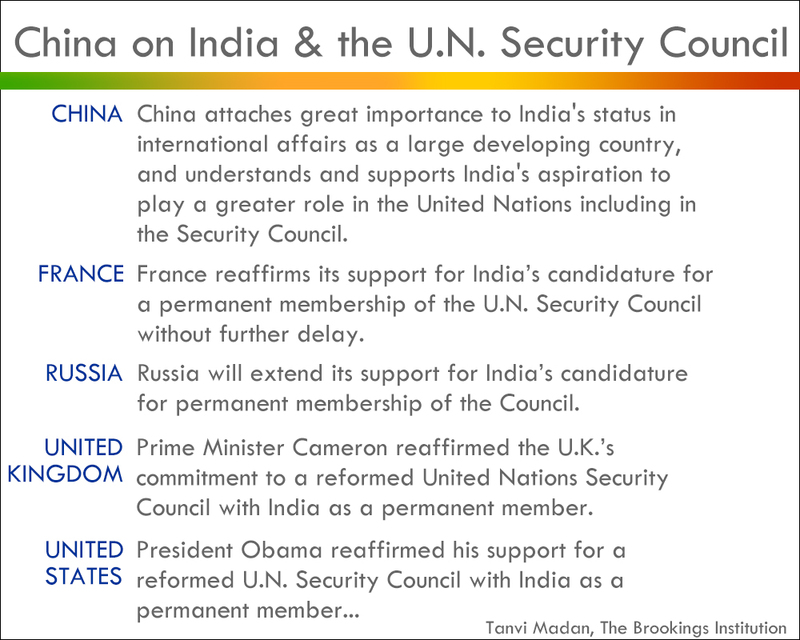 As evidence, critics highlight China’s reluctance to endorse explicitly India’s demand for a permanent seat on the U.N. Security Council and its objections to India being given membership in the Nuclear Suppliers Group. In India, there’s also a lack of trust in China and its intentions, which tends to exacerbate all these concerns mentioned. Indian governments have pursued a blended approach of engaging China, competing with it, deterring it, and preparing for the eventuality of Beijing breaking bad. The exact blend has depended on perceptions of China and its behavior, India’s strength and its options in terms of partners and instruments, as well as the worldviews of the senior policymakers involved. In the year, since Modi has been at the helm, we’ve seen him follow this blended approach, with perhaps a greater intensity—both more engagement, but also more of each of the other elements. Modi, no stranger to China, having visited multiple times as Gujarat chief minister—has repeatedly stated that he wants to do business with China (literally). Chinese policymakers, on their part, had welcomed his coming to power. 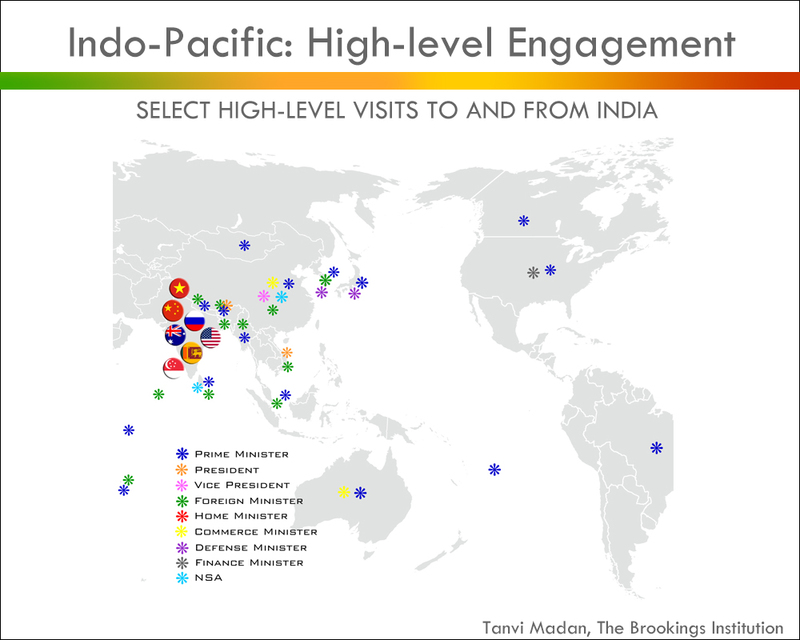 And high-level engagement has been frequent over the last year. The last leader-level bilateral summit took place when Xi visited India for the first time in September 2014. During that trip, Modi departed from protocol, welcoming the president at his hometown in Ahmedabad. The two countries signed a number of agreements, including on cooperation in the railways sector and on smart cities, as well as an understanding about the establishment of special economic zones in the Indian states of Gujarat and Maharashtra. However, the potentially conflictual side of the relationship was also evident during that visit, with a border incident coloring the atmosphere, dominating Indian news coverage, and perhaps changing the tone of the ensuing statements somewhat. 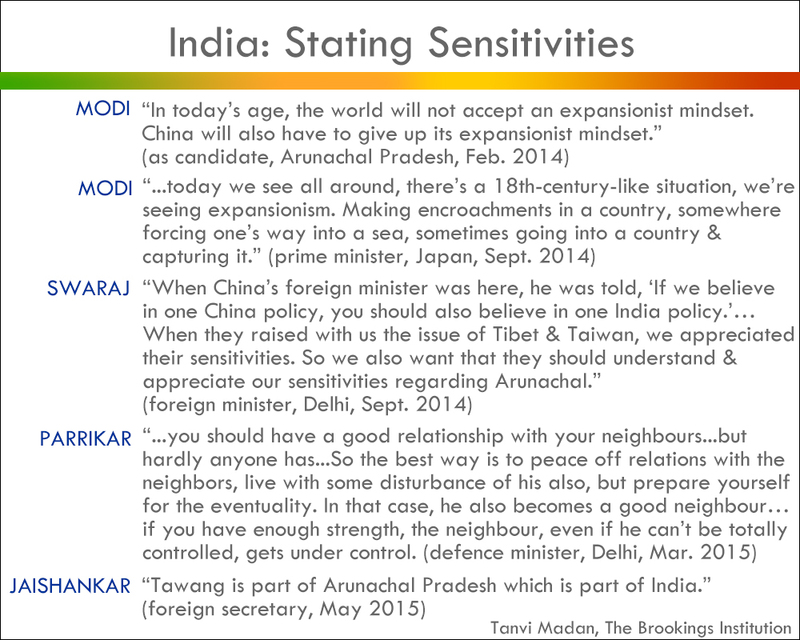 Even before that point, Modi and other government officials hadn’t hesitated to be vocal about India’s sensitivities, acknowledge the competitive element in the relationship, or express concern about Chinese behavior in the region. The Modi government has repeatedly asserted that Arunachal Pradesh is an Indian state (China claims what it calls South Tibet). The prime minister appointed a deputy home minister from Arunachal Pradesh and he and a number of other officials have traveled to the state. Indeed, in the weeks before Modi’s visit, the Indian defense minister traveled to the state, where he also went to the Tawang War Memorial; the deputy defense minister soon followed as well. The government has also focused on building up internal strength and external partnerships. On the first, beyond economic growth, there’s a stated desire to modernize Indian military capabilities, increased budget allocations for border roads development and plans to continue (and, ideally, speed up) upgrading border infrastructure. There’s also been an emphasis on better integrating and developing India’s northeast. On the partnership front, there have been two elements. One has involved India’s neighborhood; the other China’s. Modi has made the Indian neighborhood a priority, both in terms of senior policymakers’ travel, willingness to make concessions, and attempts to try to get deals done (with an announced intention of delivering on them more effectively). The second has been high-level and expanded engagement with many of the countries in China’s periphery, including Australia, Japan, the United States, and Vietnam. The government has made it clear that it will not let China have veto power or even serve as a brake on its relations with them. This engagement will continue: After he visits China, he will go on to Mongolia and South Korea. Modi will go into this visit having left his honeymoon period in India behind, but still leading a country that is considered a “bright spot” in the global economic landscape and following a year of successful engagement with countries in the Asia-Pacific region. The prime minister is aware that China sees India as an economic opportunity right now and would like to try to limit how much India expands its relations with countries like Japan and the United States. He’d like to take advantage of that to facilitate his domestic goals. 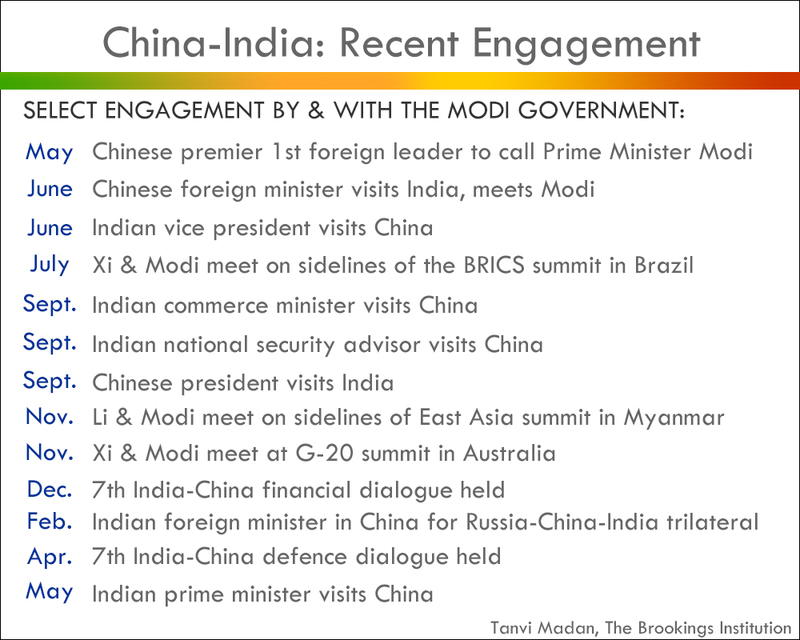 During Modi’s visit, the intent will be for the cooperative elements of the China-India relationship to feature, including economic engagement, increased connectivity and political dialogue, culture and optics. While in the past there’s been an argument that the trade imbalance can perhaps be somewhat made up for by increased Chinese investment, in recent days, the Indian foreign secretary clearly made a distinction, saying that India wanted to see both increased Chinese investment and to increase exports to China. India would also like more Chinese manufacturing in India (that will also support the Modi government’s Make-in-India initiative), pledges of investments, and increased market access for its companies and particularly its information technology, pharmaceutical, and agricultural products. They’re likely to offer to give Chinese companies more access in certain sectors, liberalise visa policy, and move toward the establishment of the special economic zones (SEZs). The chief ministers of Gujarat and Maharashtra, where the SEZs are being contemplated, will be traveling with the prime minister. Some of these policies will meet with criticism in some quarters in India, particularly the security establishment that’s concerned about giving China access to sensitive sectors and regions, and increasing Indian vulnerability to China, and in some domestic economic quarters. Beijing might be looking for endorsement of its One Belt, One Road (OBOR) initiatives (Silk Road Economic Belt, Maritime Silk Road) and has said it will “accommodate India’s concerns.” So far, while India was an early prospective founding member of one Chinese regional initiative (the Asian Infrastructure Investment Bank), it has not till now been convinced of OBOR. When asked about it yesterday, the Indian foreign secretary stated, “we have not really had a detailed discussion on this subject.” In the meantime, the two countries have been exploring a Bangladesh-China-India-Myanmar Economic Corridor. 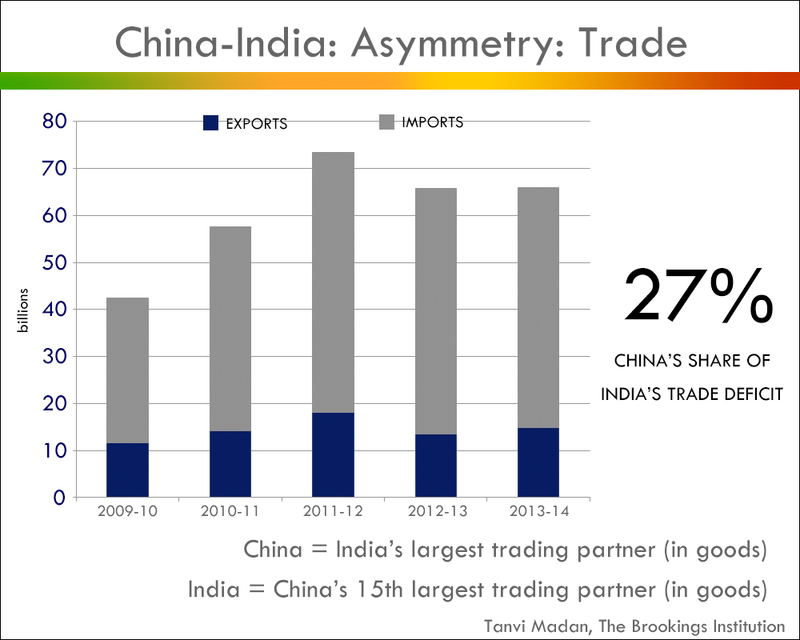 The concern on the part of Modi’s critics is that his desire to increase economic engagement with China, and particularly increase Chinese investment in India, will lead him to be “soft” on China in the short-term and leave India vulnerable to pressure in the long-term. Others argue that he will turn a blind eye to Chinese transgressions or get taken for a ride. They are particularly concerned about what he might commit to vis-à-vis the border. 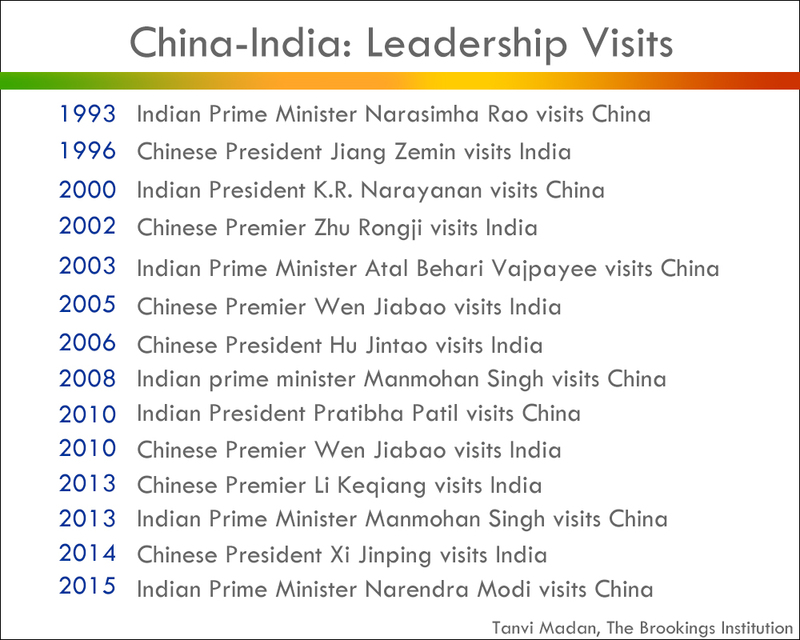 The last time a BJP prime minister visited China, in what was considered a “breakthrough” visit, India did take some steps on the Tibet question and China on Sikkim, though critics in India thought it had conceded more. In addition, the two countries will probably discuss sensitive subjects such as Tibet, as well as China’s recent commitments to Pakistan. There are two views on the latter in India—one that China’s promised investment there will threaten India, and the other that it will give Beijing a greater stake in stability in Pakistan. Taking maritime cooperation forward might also be on agenda. There will also likely be discussion of a number of global and regional issues, not least the situation in Afghanistan, the Asia-Pacific, as well as the Middle East. We’re also likely to see a fair bit of emphasis on optics, including moments of planned spontaneity—an attempt on the part of Beijing to develop the Xi-Modi relationship, reciprocate the hospitality that Modi showed to Xi when he visited India, and to convey that China does take India seriously, but also an attempt perhaps to make up for the lost opportunity during the last visit, when the border incident jettisoned any public relations gains that Beijing had had in mind. Modi, in turn, is likely to highlight culture, especially Buddhism. This is part of his broader attempt to reclaim and highlight India’s cultural contributions to the world, including yoga—there’s a scheduled yoga-tai chi joint event planned during this visit as well. The highlighting of Buddhism, in particular, serves different purposes: creating a bond with China, stressing India’s long-standing connections to Asia (thus also resisting being restricted to the “South Asia” box), as well as pushing back on any notion that China is India’s superior in civilizational terms—witness Modi’s statements and tweets on how Buddhism traveled from India to China, a connection that China used to try to downplay.